Halfway through The Favourite, I realise it’s coming across like a sumptuous cross-breed of Kubrick’s Barry Lyndon (1975) and the TV show The Thick Of It. The former’s portrait of 18th century aristocrats employed solely natural light for visual credibility, including only candles for night scenes. Meanwhile Armando Ianucci’s vicious political satire lampooned the inane squabbling upon the seat of power. In gloriously sweary fashion. This latest from Lanthimos is just as delightfully foul-mouthed, and just as authentically lit, but here it’s the highest tiers of royalty being illuminated. The early 1700s. 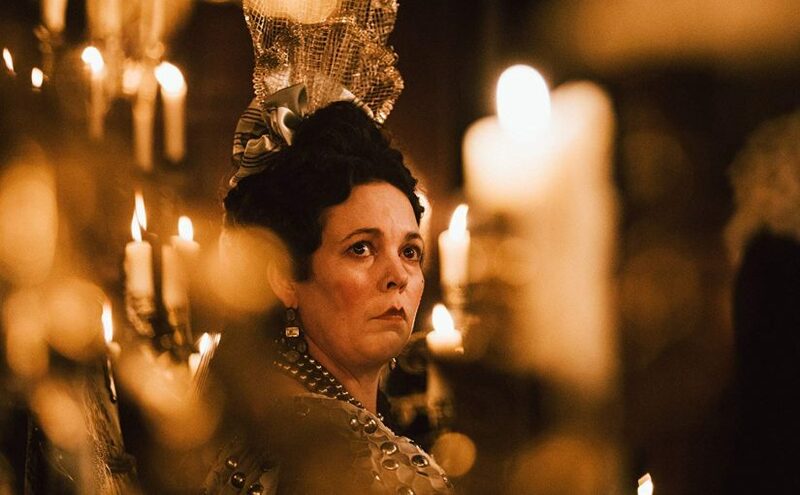 An embattled Queen Anne (Olivia Colman) is caught in a constitutional impasse. The Whigs are demanding decisive action in the war with France, while the Tories argue that the public tax needed to fund such an operation would finally tip the country into unrest. The decision rests on Anne’s shoulders, and this most petulant (and frankly, ill) Queen is clearly out of her depth. Enter disgraced socialite Abigail (Emma Stone), distant cousin of the Queen’s right-hand, Lady Sarah. Her family’s fall from grace sees her working as a servant girl, but if she can infiltrate the Queen’s inner circle by befriending Sarah (Rachel Weisz) she’ll have a laced shoe back on the ladder of nobility. Won’t she? Colman has gained all the pre-release plaudits for her portrayal of a cantankerous, unhinged, depressed, child-like Queen, and she is magnificent. Such an overcharged, tragi-comic turn will inevitably be the film’s crown jewel. But Stone and Weisz are just as good, completing the core central trio. Stone’s character is wily, ever adapting to her own advantage, while Weisz excels with a performance of cold resilience. Both are continually trying to outwit each other’s lust for control. Mark Gatiss, Nicholas Hoult and The Thick of It’s own James Smith provide a supporting network of preening masculinity. The female triangle at the heart of the piece might harbour exceptionally dark streaks, but the men are equally duplicitous. It’s just that all of them are dolts too. Lanthimos’ previous two films, The Lobster (2015) and The Killing of a Sacred Deer (2017), although set in the modern world, utilised weirdly unnatural dialogue patterns, which pushed both works into the realm of symbolic fable. Though that style is gone here, it’s just as eccentric a drama, but with a very different flavour. And if you consider all three movies together, that the historical piece uses the more natural speech could, itself, be taken as a comment on how surreal contemporary life seems to the director. After all, this screenplay is based in fact. How close it is to the genuine truth can never be known for sure. But it turns out that a surprising amount of this scandalous fancy could be closer than one might casually assume. The lavish recreation of the palatial setting makes every frame an optical treat. Thanks to the occasional but regular use of a fish-eye lens, it’s as if we’re viewing life down the telescope of history, or as if in a specimen dish. It’s a neat touch that evokes art from the period, while also emphasising how distanced we now are from it. With a sublimely simple but memorable parting shot that simultaneously encapsulates and tops the absurdity we’ve just witnessed, The Favourite will stand tall as a cinematic one-off. And one of the strangest accounts of British regal history. The current brexistential crisis crippling politics may be beyond satire. Perhaps it takes an anti-establishment farce as odd as this to peel back the layers and reveal the hysteria that the seductive lure of power can inspire.